During Akademy, I saw that a lot of people had a very modern looking Mail program, which I didn’t know, and I was surprise to hear it was KMail. 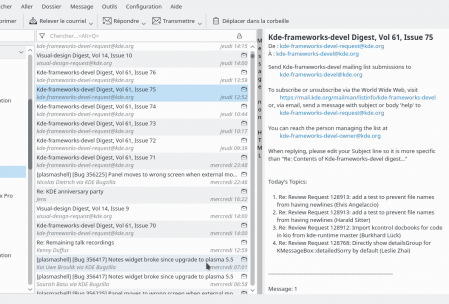 I used KMail at work (during the whole year, yes this year), on a KDE4 station, and honestly, I didn’t like the experience. At all. So I kept using Thunderbird, which I’m used to etc. However, I grew bored of the interface, there is not much innovation, and most modules are just not maintained any more. So seeing this nice UI I told my self “eh, let’s give a try again”. So I pacman-S-ed kmail2, which was overall 3 Mo only (I use Plasma and Korganizer, so I guess I already had all the dependencies people are complaining about). Setting up KMail’s account (I have 4) was quite obvious, like Thunderbird and most other Mail managers. I had a lot of issues finding out how to define my Sent and Draft folders. The Trash was where I expected (in the account management) but the 3 others in the Identity management. Why? What is different between theses 3 folders? This leads me to another question… Why identities and accounts are separated? Are there use-cases where you have one identity for 2 accounts? I have 4 identities, and 4 corresponding email accounts. So to me it’s just more thinking to have when I want to change configuration. Is my answer model based on my identity or my account? And the SMTP parameters? If it were me, I would put the identity section as the first tab of the Accounts settings. But that’s only me. Else, by going through the menus, everything gets done quite fast. Out of this, I really like the fact that it’s starts very fast and that it’s very responsive. Also since I use my Nextcloud instance for all my PIM-related stuff (contacts, calendars, …), everything is integrated thanks to Akonadi. Really, don’t kill it, it’s so great to set things up once for all programs. I also followed the advice I was given (by Cola I think) to use the 3-columns disposition. The experience is just amazingly better (you can do that with Thunderbird as well, but it looks too clustered on my tiny screen). Bug 362575, which prevent unsubscribing IMAP folders, so I get several useless folders like “Contacts”, “Notes”, “Journal,” etc. (it’s a Microsoft Exchange account). Crashes when I try to affect a new tag to an email (I get a segfault). And finally I expected that selecting 3 emails and click “Reply” would create an email to all recipients. I would really like to have such a feature, but hey, after 2 days, I think it’s working quite good. I’m also quite confused about “Local subscription”, “Server-side subscription”. What is a model (reply model from the config menu, model you save, or reply with personalized model)? Still don’t know :S.
Maybe you should ping the VDG/Usability guys and see what to change in the organization and names? 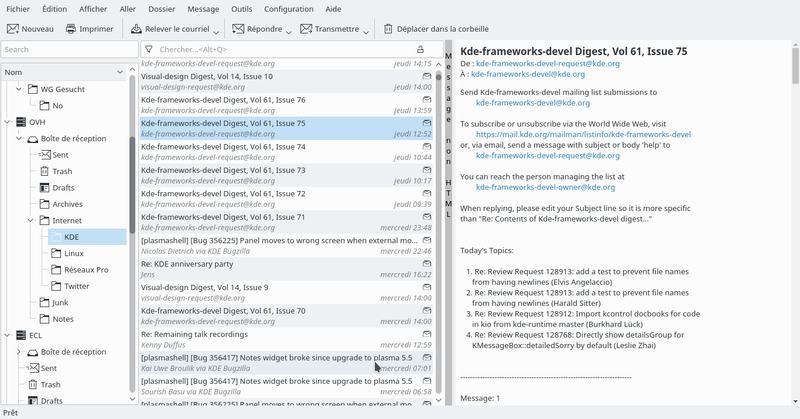 Finally my experience with KMail is a good experience, and I think I won’t need to go back to Thunderbird. Guys, you did great job since KDE4 on this project. There is still some bugs and UX issues, but IMHO you are on the right tracks. Keep up the good work! I have 2 accounts (my personal Postfix/Dovecut setup) and university mail. University SMTP server breaks GnuPG signatures so I use my own postfix server to send emails with university identity… So there are use cases where identities ≠ accounts. That was a problem some time ago. But really, try it now and you will see that even Akonadi has been optimized hugely. i’m using it every day and i’m using the latest stable version. the problems still exist and nothing is getting better. right now for example i deleted mails with were simply reappearing again after 1-2seconds… why does something like that happen if it’s so stable and optimized? it’s simply a way too complex backend for the stuff they can maintain with the manpower available. it’s sad but true. It happens because it’s a known and fixed bug (https://bugs.kde.org/show_bug.cgi?id=354056). It’s still happening to you because you are probably using Kubuntu, which hasn’t been updated since like 5 months ago and doesn’t have the fix (and plenty of other fixes, despite being the “stable” distro). I’d recommend switching to something else if you want timely updates. I use KMail and I’m very very happy with it. I really like KMail but my experience is just okay. 1. Configuration is a mess. It’s cakewalk to configure thunderbird and walking on fire to setup KMail. 2.You won’t have a lot of problems if you are using NextCloud but for rest of the email services you are going to have a lot of trouble. Emails will go out of sync. 3. Contacts and Calendar support are horrible. Korganizer is right from 90s. 4. Unnecessarily bloated with Journals, todo, etc. Either have an awesome experience with what you ship or please don’t ship at all. 5. As far as UI and functionalities are concerned nothing beats Kmail. I’m glad you like KMail 🙂 The identity-account separation was exaplained above, so I won’t go into that. You will however be happy to hear that there are plans on making the account configuration much much streamlined. Since most users seem to have the same usecase as you do (i.e. 1 identity per account), the plan is to have the UI built around on this assumption. It will still be possible to share multiple identities with single account or vice versa of course. The separation of Sent and Trash folder configuration is another thing that I want to address in the next release as part of the configuration overhaul. Local vs. Server-side subscriptions: server-side subscription means, that the folder subscription is modified on the IMAP server – i.e. if you server-unsubscribe from a folder, the folder will not be visible in your webmail interface and will never be synced by KMail or other email clients. If you unsubscribe locally from a folder, this will only cause KMail to never show the folder, but will have no effect on how the IMAP server or other email clients see or treat the folder. We do want to cooperate more closely with VDG in the future – I’ll be working on the configuration update mentioned above together with Bjoern Balasz and we will talk to VDG more regarding some of the possible UI improvements in the main UI of KMail. Good to read from you! Thank a lot for answering and for the time you spend on KDE PIM.